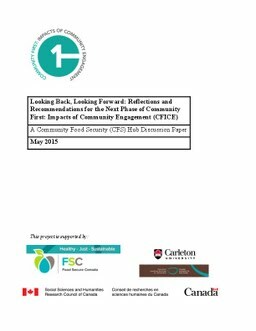 In the winter of 2015, when the Community First: Impacts of Community Engagement (CFICE) project was in the preliminary stages of planning its transition to Phase II, the Community Food Security (CFS) Hub prepared a discussion paper to synthesize collective reflections from hub partners on their proposals for action priorities to be implemented over the next four years of the project (2015-2019). This discussion paper was developed based primarily on interviews conducted with approximately 30 individuals representing the broad array of community- and campus-based partners related to the CFS Hub and reflections from the CFS Hub Management Team. Following the release of this discussion paper, the CFS Hub gathered additional feedback from CFS Hub participants. at a CAFS meeting in May 2015, and via email for those unable to attend.